Training is good, but being a "natural" is better! GURPS Fourth Edition brings this real-life adage to the gaming table with Talents – advantages that improve groups of related skills and make them easier to learn. But so many Talents appear in so many GURPS supplements that choosing among them can involve tiresome amounts of page-flipping. 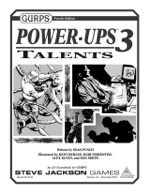 GURPS Power-Ups 3: Talents solves this problem by collecting all the "official" Talents in one place, noting their point costs, skill lists, and reaction modifiers – and their original sources, for campaigns that use only certain GURPS supplements. Alternative Benefits. Replace the reaction bonuses granted by Talents with a wide range of other possibilities. Anti-Talents. Flip Talents on their head for characters who suffer from broad-based incompetence. Extended Talents. Crank Talent up to 11 . . . for times when four levels just aren't enough. Learning Talents. Develop your Talent in play. Smooth Talent Cost. Price Talents more precisely, whether to curb abuse or to encourage use. Talents as Training. Adapt Talents to work as intensive training instead of as natural gifts. If you like Talents, then you'll love all the examples and options that Power-Ups 3: Talents provides! 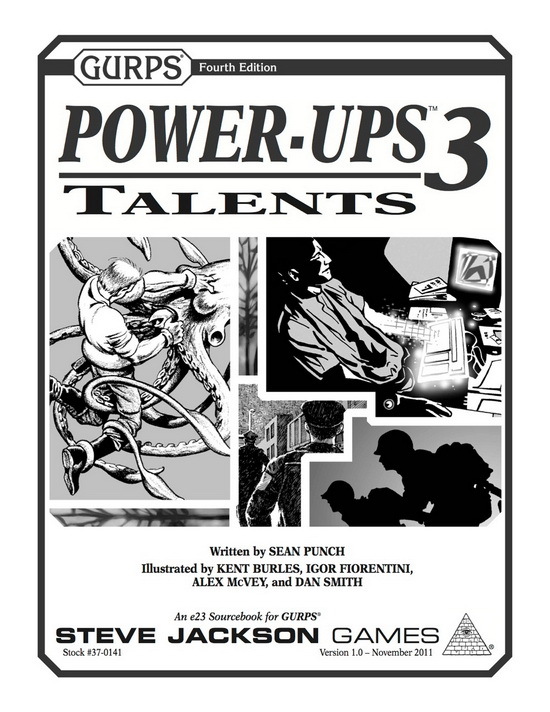 Power-Ups 3: Talents requires only the GURPS Basic Set, Fourth Edition. Check out GURPS Powers for everything you need to create every kind of amazing, off-the-chart superhero you can imagine . . . as well as amazing wizards, wuxia fighters, shamans who command spirits . . . even gods!